Buy online 24C04 EEPROM at Low cost in India at DNA Technology. The 24x04 are 4 Kbit electrically erasable programmable memories (EEPROM), organized as 2 blocks of 256 x8 bits. They are manufactured in STMicroelectronics’s Hi-Endurance Advanced CMOS technology which guarantees an endurance of one million erase/write cycles with a data retention of 40 years. Both Plastic Dual-in-Line and Plastic Small Outline packages are available. The memories are compatible with the I2C standard, two wire serial interface which uses a bi-directional data bus and serial clock. The memories carry a built-in 4 bit, unique device identification code (1010) corresponding to the I2C bus definition. 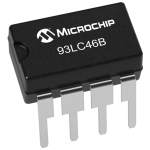 This is used together with 2 chip enable inputs (E2, E1) so that up to 4 x 4K devices may be attached to the I2C bus and selected individually. The memories behave as a slave device in the I2C protocol with all memory operations synchronized by the serial clock. Read and write operations are initiated by a START condition generated by the bus master. The START condition is followed by a stream of 7 bits (identification code 1010), plus one read/write bit and terminated by an acknowledge bit. 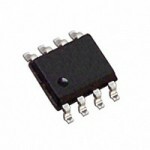 EEPROM 24C08 SMD 24C08 is an 8K bit Electrically Erasable PROM intended for use in extended/autom..